If you run a small business, you don’t need all the reports that QuickBooks offers, but many of these reports are extremely useful. Reports show you how healthy or unhealthy your business is, where your profits are, and where you’re wasting time and squandering resources. To make sense of what might otherwise become mass confusion, QuickBooks organizes all its reports in categories. You can see all the categories by pulling down the Reports menu or by clicking the Report Center icon. The names of the reports read a bit like public television documentary names, don’t they? “Tonight, Joob Taylor explores the mazelike federal budget in Budget Reports.” You select a report category to see a list of report names. In the list below, reports are described by category and a short description of the major reports are given in each category. To get a thorough description of a particular report, go to the Help feature. To find out what a standard profit and loss report does, for example, choose Help → QuickBooks Help and then click the Index tab. 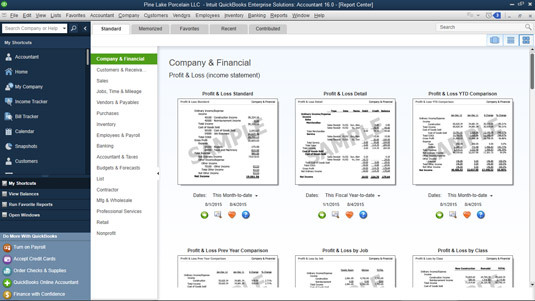 Type financial statements in the text box. (The Help information includes a wonderful discussion about how to understand the profit and loss and balance sheet financial statements.) Or, from the Reports Center, select the type of report on the left; you see a list of the different reports available on the right side, with a description of the information contained in each one. To read the details about a topic, click that topic in the list. net profit or loss over time. customer, job, and aging status. Sales These reports show what you sold and who your customers are. activities, and look at vehicle mileage. includes a report for determining sales tax liability. your payroll liability accounts. These reports come in handy. Banking These reports list checks and deposits. ledger reports, and a trial balance. detailed report of your inventory. If you’re not sure which specific report you want, you can use the Report Center. Just choose Reports → Report Center and then choose a report category from the list along the left edge of the Report Center window. QuickBooks displays a picture of the most common reports within the category in the Report Center window.